Setting up tutoring for my son was quick and easy. We were able to secure service within a few days even though we requested help at a very busy time during final exams. Having the tutor come to our home made the experience seamless for us as busy parents. Our tutor was highly qualified. He had vast knowledge of the subject matter and he could teach. The tutor not only covered content, but he was able to analyze the learning habits of my son and leave him better equipped to do well in all future courses of study. Our tutor was kind and very personable and we all enjoyed seeing him every week. I highly recommend Mobile Tutors. The benefits to a student is well worth the financial investment. We will continue to use Mobile Tutors. My STAT 235 tutor was always on time and well-prepared for every tutoring session. He knew everything about the course in great detail and could explain everything very clearly in a very simple way. He helped me to excel in my STAT 235 course. I highly recommend Mobile Tutors tutoring services to any university student who needs help in Statistics. Our boys have been with Mobile Tutors for about a year and a half now. They are currently in a French Immersion Program and the instruction they receive from Mobile Tutors supplements the French language art instruction that they receive from school. We have been fortunate in that we have had the same tutor since we started using Mobile Tutors services. Our tutor is professional, prepared, on time and very flexible. As with anyone having kids in school knows, juggling schedules can become quite hectic, our tutor is always willing to accommodate changes. In addition to being knowledgeable about what material is being covered in the classroom, our tutor will provide work to reinforce concepts and is always willing to answer questions outside of our scheduled sessions via e-mail or text. We are pleased with the service we receive from Mobile Tutors and the level of instruction received in our own home makes the tutoring process so much more convenient. I am only disappointed that I did not know about this service earlier! Mobile Tutors is an extremely dynamic organization. With the help of Mobile Tutors, my son who was struggling academically ended the school year with an honours certificate in grade 6 reading. I will recommend Mobile Tutors to every parent. They made a huge difference in my son’s life. We were looking for a grade 12 Math 31 tutor for our son who would come to our home. An Internet search brought up Mobile Tutors. After talking to the Mobile Tutors Education Consultant we knew he employed the quality of tutor we were looking for. Someone who was more mature and had a solid grasp of the subject matter. Our tutor was knowledgeable beyond our expectations, calm and patient. We watched our son go from frustration and a failing grade to confidence and an excellent grade. We would definitely call Mobile Tutors if we needed their help again. My family has used Mobile Tutors for the last two years and we are so glad we found them. Last year my son in grade 11 began to struggle, not that he was failing but just that his grades were dropping and it became evident to us he needed help. When we first mentioned getting tutors for him he viewed it as a punishment but within a few weeks of getting the tutor in Math, Chemistry and Physics he realized what a gift it was. This year he began grade 12 and asked if we could get him tutors right away instead of waiting until he was struggling. He realized the knowledge and assistance the tutors at Mobile Tutors offers is such a benefit to him. It really helps him be less stressed and if there is something he doesn’t completely understand the tutor is very capable of explaining and helping him understand it. We have had 5 different tutors through Mobile Tutors and they have all been top notch. We have been very impressed and pleased with their professionalism and expertise. I would highly recommend this tutoring service and know my friend who I recommended it to last year was equally impressed. 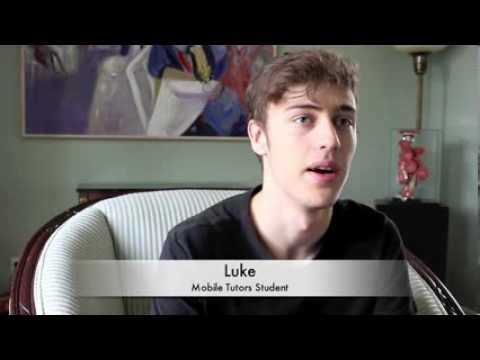 My son has benefited from the high quality tutoring from Mobile Tutors for over 2 years. His grades in junior high went from the mid-50s in most subjects to a level where he was accepted into the IB program in high school. He is now in his second year of high school, still in the IB program and still benefitting from Mobile Tutors. Last year we utilized the services of Mobile Tutors for our son in Grade 10. We were impressed with the Mobile Tutors Education Consultant’s commitment and professionalism in meeting our needs. The tutors from Mobile Tutors were wonderful. They were flexible in scheduling and in their location to meet. With their help our son was able to succeed in his classes as he would not have passed last year without their help. We were so appreciative that we have decided to use his services again this year but in a more pro-active approach. I would highly recommend this company to others without hesitation. It has made our lives so much easier. Keep up the great work!